With the holiday season closing in, the time for togetherness is drawing nearer with every passing day. Gifts for loved ones, to show your appreciation for being there for you during the past year and celebration of the spirit of Christmas are iconic of the year end festivities as December draws closer. It is with great honor that we declare our inspiration from the Portrait of Adele Bloch-Bauer I by Gustav Klimt. Gustav Klimt belonged to a family known for its creativity and artwork. Ernst Klimt the Elder, his father, was a gold engraver, and his mother longed to be a musical performer. Even his brothers Ernst and Georg were creatively gifted. He and his brother would later go on to form a team to assist the revered painter during the period - Hans Makart. The brothers studied in the Vienna School of Arts and Crafts, where they came under the guidance of Makart and formed the “Company of Artists”, known for painting murals. Soon after, Emperor Franz Josef I of Austria honored Klimt with the Golden Order of Merit for his contributions in the field of art in the Burgtheater. Gustav Klimt is widely known for The Portrait of Adele Bloch-Bauer I and The Kiss, which became popular for its artistic quality and scandalous history. The portrait, which took three years to complete, exhibits the distinct use of golden leaf in Klimt’s art forms and was judged to be revolutionary. Adele Bloch-Bauer, who died from meningitis, donated the paintings done by Klimt for her, to Austrian State Gallery, according to her will. When the Nazis invaded Austria, her husband had to flee to Switzerland, leaving behind their belongings, including paintings, which were later seized by the Nazis. According to the 1945 testament, Block-Bauer’s nephew and niece had been named the inheritors of the estate. But since the art had remained in Austria, the government decided to keep the masterpieces in the country itself. After a prolonged court affair, it was decided that four Klimt pieces were to be inherited by Maria Altmann. In 2006, it was bought by Ronald Lauder for $135 million and was the most expansive painting at the time. Currently, the beautiful manifestation sits in the Neue Galerie in New York. 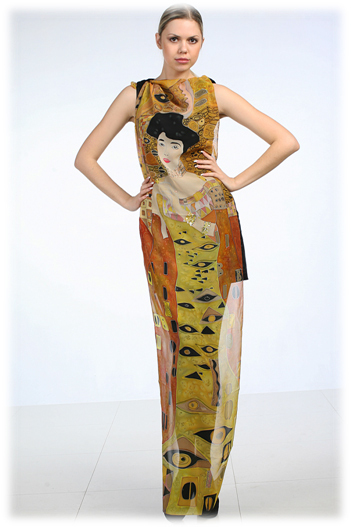 We, at WomenClothingToday.com, would like to pay homage to the master painter Gustav Klimt and his creation with three scarves inspired from this masterpiece. This Christmas, is there a better gift for your loved ones who admire art and master artists, such as Gustav klimt, than these silk scarves? The scarves are but a humble gesture from us to remember Gustav and make your Christmas memorable!